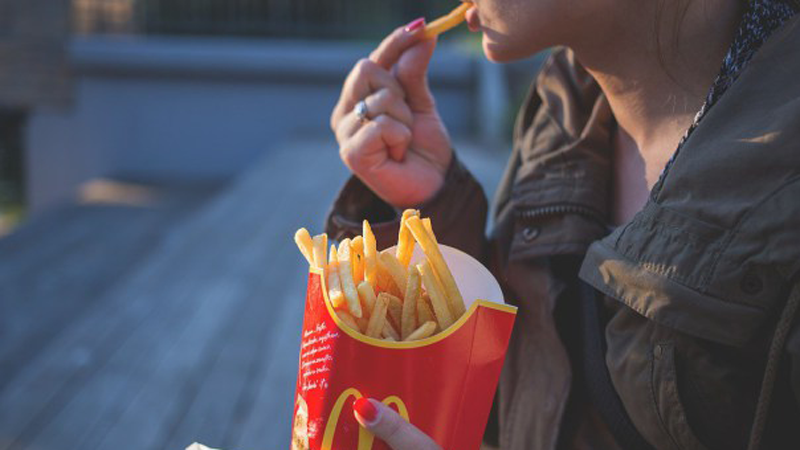 We’ve all had days when our head hits the pillow, totally disappointed by our unhealthy food choices. Ideally, we’d eat three healthy meals every day, but our busy on-the-go lifestyles often necessitate quick, convenient or even skipped meals. When three healthy meals aren’t in the cards, I propose making one super healthy meal for lunch to save the day, nutritionally speaking. 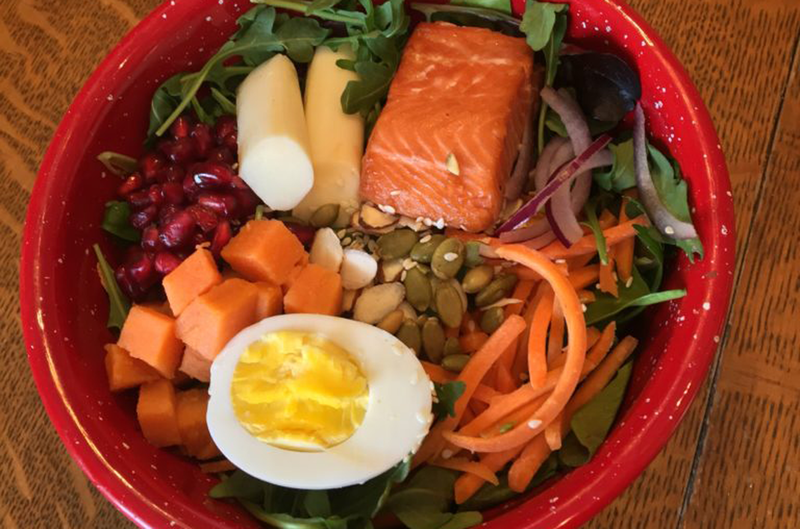 Let me introduce The Chosen— a delicious, 680-calorie entrée salad that provides from 30 to over 100% of the daily recommended intake of 23 important micronutrients. 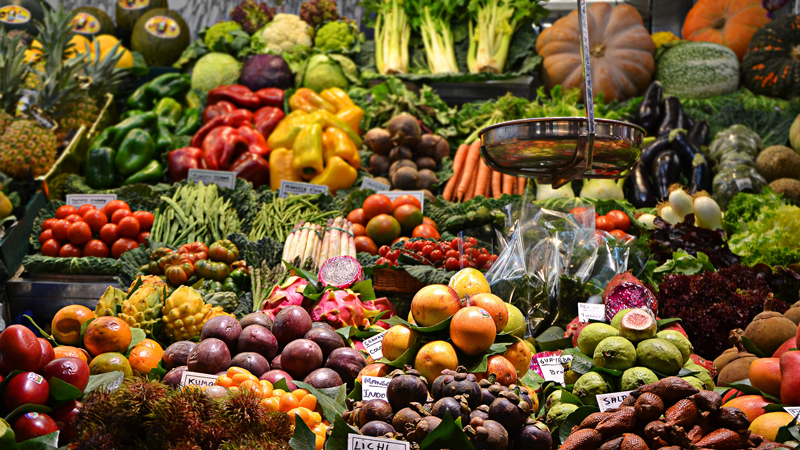 Research continues to support the health benefits of eating a diet high in micronutrients, which contribute to increased energy production, immune system strength, decreased inflammation and prevention of several chronic diseases. Eating The Chosen Salad for lunch can help make up for those rushed breakfasts or unpredictable dinners that lack fresh fruits and vegetables. Plus, if you’re like me, you’ll sleep better knowing that you ate at least one nutritious meal. It’s perfect for making the day before for your lunch! You’ll notice that The Chosen provides over 100% of the daily requirement for some of the micronutrients like vitamin K and phosphorus and less than 50% of others, like calcium and iron. One of the major challenges I faced when building The Chosen was including nutrient-dense ingredients that taste good but are not loaded with excessive calories or saturated fat. For example, the recommended intake of calcium is 1300 mg/day for most adults. If you obtain all of your calcium from cheddar cheese, you’d be consuming over 600 calories and around 36 grams of saturated fat! On the opposite end of the spectrum, one cup of chopped kale contains 24 mg of calcium, has 33 calories and no saturated fat, but you’d have to eat 54 cups of kale to reach the recommended calcium intake… you do the math. I channeled my inner accountant and added and subtracted different ingredients until I reached a healthy balance. In the end, calcium, choline, iron, potassium and vitamin E were the most difficult micronutrients to incorporate in large amounts without exceeding the calorie limit for a typical meal. Luckily, it’s quite easy to incorporate a glass of milk, a banana, and lean red meat into breakfast and dinner to help round out the day. I had a great time building The Chosen, but it took several hours to reach the final product. If you don’t want to quit your day job to become a full-time nutrient accountant, Nutrilyze can help! A large part of the Nutrilyze score depends on the micronutrient content of a meal. Meals that receive higher scores typically provide at least 33% of the daily recommended intake for most of the micronutrients (assuming you eat three meals a day). The Chosen scores 95-100 for most adults because it is packed with micronutrients from fruits and vegetables that do not contribute excessive calories, added sugar, sodium or saturated fat. For example, I am a 36-year-old female, average height and weight and I exercise about 3 days per week. Here’s how The Chosen scores for me: Nutrilyze Score: 99, macronutrient score: 100, micronutrient score: 99, detriments: 99 (a score of 100 for detriments equates to zero points lost from excessive calories, added sugar, sodium, trans fat or saturated fat). 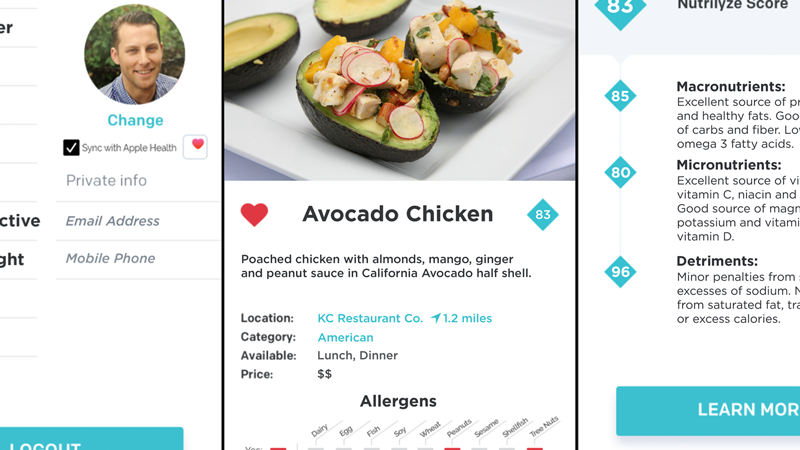 For times when you can’t make it to the grocery store or you’re eating out for lunch, the app can easily direct you to high-scoring salad options offered by restaurants near you. Here are a few chain restaurant salads with my personalized Nutrilyze scores. Remember that your Nutrilyze score will be different than mine! Summary: An excellent source of protein and fat and several important micronutrients like vitamin A, K and phosphorus, however, not a substantial source of carbohydrates, vitamins B12, D, E, calcium or potassium. The lower score is due to excessive sodium and an inadequate amount of carbohydrate and several micronutrients. Summary: An excellent source of all the macronutrients and several micronutrients including vitamin A, B6, K and phosphorus, however, not a substantial source of vitamin D or potassium. The lower score is mainly due to excessive saturated fat, sodium and added sugar from the feta cheese, salad dressing and dried fruit. Summary: An excellent source of all the macronutrients and several micronutrients including vitamin A, B6, C and phosphorus, however, not a substantial source of vitamin D, B12, calcium or choline. The lower score is mainly due to excessive added sugar and sodium from the peanut sauce and dressing and inadequate amounts of certain micronutrients. Summary: An excellent source of all the macronutrients and several micronutrients including vitamin A, B6, B12 K and phosphorus, however, not a substantial source of vitamins D or E. The lower score is mainly due to excessive saturated fat, sodium and added sugar from the feta cheese, candied pecans, and salad dressing and inadequate amounts of several micronutrients. Notice how some of the salads listed above received high macronutrient and micronutrient scores, but how the penalties from excessive calories, sodium or saturated fat decreased the overall score. Jump on the app to find which salads score the highest and lowest for you, keeping a special eye on the micronutrient score. Try adding The Chosen and other high-scoring meals to your week and let your head hit the pillow in peace. Soon you’ll be able to find The Chosen and other healthy recipes like it on the Nutrilyze app. With this new feature, you will be able to view your personalized scores for recipes that you can make at home. Follow/like/subscribe for Nutrilyze updates. Nutrilyze is a personalized nutrition application that helps users discover what they should be eating from local restaurants to fit their body type and health goals.